The front-serviceable and high-resolution product line to meet both the performance demands and budgets of indoor LED video designs. The What: Created to meet the high demands of budget-friendly, indoor video installations, PixelFLE has introduced the new EF Series. In addition to its straight-forward design, EF Series tiles are fully front serviceable making it an ideal wall-mount solution for house of worship, entertainment venue, corporate facility, and more. The What Else: The EF Series also offers custom upgrade capabilities to meet the specifications for right-angle and curved displays, and is available in a 3.9mm, 5.2mm or 6.25mm pixel pitch. With multiple cabinet sizes and built-in alignment pins to guarantee proper alignment of panels, the EF Series is complete with standard power and data connectors, as well as pass through channels, making wiring quick and easy. 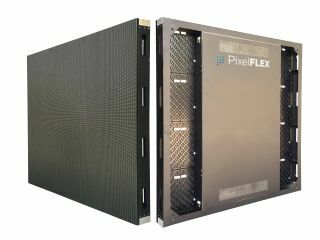 The Bottom Line: "Understanding the fine line between quality and affordable LED video solutions, our talented engineering team developed a high-resolution and creative product line which reduces the manufacturing and installation costs, and allows us to pass those savings on to the end user,” said David Venus, PixelFLEX Chief Marketing Officer.